BPMN stands for Business Process Modeling Notation. This is one of the most used standards in the world for process modeling. Most organizations depending on process modeling use this standard. 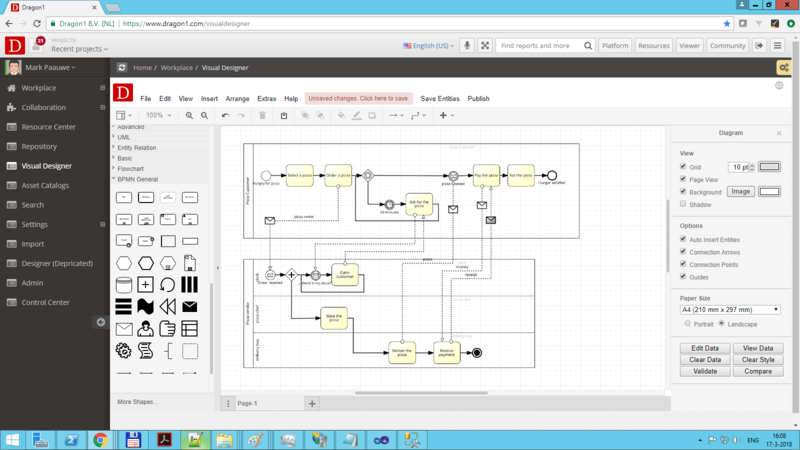 On Dragon1 you can do BPMN modeling in two ways: restrictive and free. Restrictive BPMN modeling means you are prevented from modeling disallowed relations or connections. Free BPMN modeling means you are allowed to modeling any type of relation or connection you want. Optional you can use the validator to check what invalid relationships or connections you have created. Save and Publish your diagram to be viewed and commented by your stakeholders.